The mass layoffs currently coming to pass at the University of Southern Maine are the final moment of metal collision in the slow-motion train wreck we’ve been watching over the last couple of years. The USM faculty have been nauseously swaying out in the wind over the last handful of years. After finally gaining a contract, it appears that any security offered by this contract is fairly illusory. Tenure is a means to certain ends; specifically: (1) freedom of teaching and research and of extramural activities, and (2) a sufficient degree of economic security to make the profession attractive to men and women of ability. Unfortunately for tenured USM faculty on the chopping block, the guarantee of tenure technically protects only individuals from being removed from existing positions; it does not protect people in positions which are altogether eliminated. Nonetheless, we absolutely see a violation of the principles that tenure is intended to protect in the execution of the faculty-layoff plan. The layoffs disproportionately impact women: nine of the eleven faculty laid off are women, in an institution where women make up less than 50% of the faculty. The disproportionate disregard of women’s tenure makes it pretty questionable whether women considering working at this institution could truly consider themselves free to teach or research in the way they’d see most fit. Similarly, this action makes it difficult for potential professors to view USM as a reliable academic employer in the future. To the extent that a capable individual with a substantial training investment already loses money when she chooses a job in academia over industry, it’s important for academic institutions to do what they can to demonstrate “a sufficient degree of economic security” in order to make that difference worth it. USM is presently cutting two economists, who generally do quite well in the open market. What rational economist would come to work for USM in the future? The whole situation is just awful. The state into which USM has been permitted to fall is a terrible tragedy. The university and state should be making much better use of the campus they have situated in the most populous, vibrant, and livable city in Maine. Why are they looking to further weaken this institution? The state of Maine has certainly led the way to this outcome, reducing 20% of its funding to the university system between 2002 and 2010 and further reducing since then. As a result of having less and less to work with, the cutting of positions was more or less inevitable. However, here we are. The present cry of protesters, seeking to save the professors, has been to ask the university to “chop from the top.” What does that mean, exactly? How much would that save, relative to other measures? How does the entire University of Maine workforce break down along these categories? Here are two pie charts to explore that: the first describes the proportion of the 4,794 listed employees in each of the official bargaining-or-non-represented groups; the second provides categories that simplify several of the bargaining groups. These salary averages, put together with the total number of employees in each category, gives us a sense of the relative weight of each group of employee on the balance sheet. 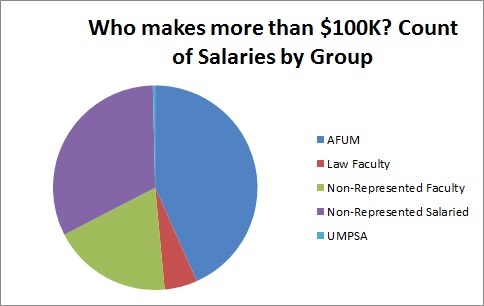 The top four categories are three faculty categories – law faculty, non-represented faculty, and union faculty – plus “non-represented salaried,” a category made up primarily of administrators and management. The remaining seven categories, although collectively constituting the largest number of employees, have substantially lower average salaries. The pie charts below describe the relative proportion of each group of employees in making up the university’s total salary expenditure. Again, the first pie chart uses the given bargaining or non-represented groups and the second contains my simplification of these groups into more conventional categories. As a final cut at this, I looked at the proportion of each of these categories in the list of 270 University of Maine employees making $100,000 or more. 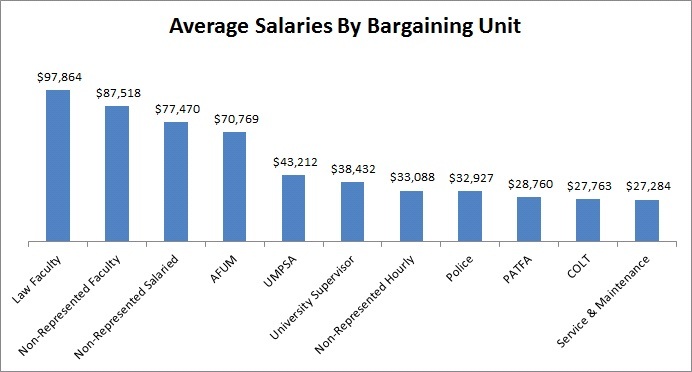 Although “non-represented salaried” workers make up about 10% of the total employees, they make up 16% of the university’s total salary cost and about one-third of the 270 University of Maine employees making $100,000 or more. What should USM do? I think the state is the one that should be paying more, since it is clearly their reduction in funding that has made the biggest change in university revenues. However, I’d also be looking to administrators who seem not to be able to do their jobs in securing that funding to be offering funding up from their own departments, rather than hollowing out the value of their very product. Instead, this move they’ve taken has destroyed the attractiveness of being employed by – or enrolled at- USM for the foreseeable future. Good work Emily! I’m also working with that salary data and the PATFA service lists for a related question. Converting from pdf to excel is a bit messy, but once you get it in a format you can massage, you can get some good information out of it!